Around Christmas I spent some time reflecting on what the point of yoga is, or rather what is the point of my yoga. To be sure when I started asana practice I had very limited ambitions, and they were all about me. Nothing wrong with that. We all start somewhere. And something I’m realizing about yoga is that it changes all the time, or perhaps it changes me all the time. I first turned to yoga when I started to learn Mindfulness meditation. Because I was following a MBSR Mindfulness course there was an emphasis on sensing your body in meditation. And I realised not only that I found body-sensing really difficult (I sometimes wondered if my brain was actually attached to my body at all! ), but I noticed that when we practiced simple mindful movements, my sitting practice afterwards was much more focused. And so I started yoga because it supported my meditation practice and it made me feel better. But gradually something shifted in my perspective. Just as increased compassion has been cited as a by-product of mindfulness meditation, I wonder if yoga asana practice similarly tends to cultivate empathy and compassion beyond oneself? I used to rationalise the feelings I increasingly had of greater care and attention to the needs of others — even dare I say greater love to my fellow human beings — as simply the result of having more energy and feeling less sick so that I had spare attention to bring to others. I don’t really understand what’s going on here. Yes, it’s about giving energy, but in a much more subtle way than I first thought. So I started to reframe my aim in yoga, to encompass much more than my own wellbeing. I still felt weirdly guilty about the time and energy my practice took up and the impact that sometimes has on those around me, but lokah samastah sukhino bhavantu reminds me that this impact can be very positive. And now today I’m not so sure I really need an aim at all. I was talking with a friend recently about Christian beliefs. She suffered my naive questions that were ignorant verging on impertinent with great patience — and some degree of humour I think! I am a born atheist, and don’t really have much sense of any organized religion. So I asked her lots of stuff (about prayer and ritual, the concept of a personal god, the importance or not of community and more…), but it didn’t cross my mind to ask her why she was Christian, what the point of it was. So why should I ask myself that of my yoga practice? 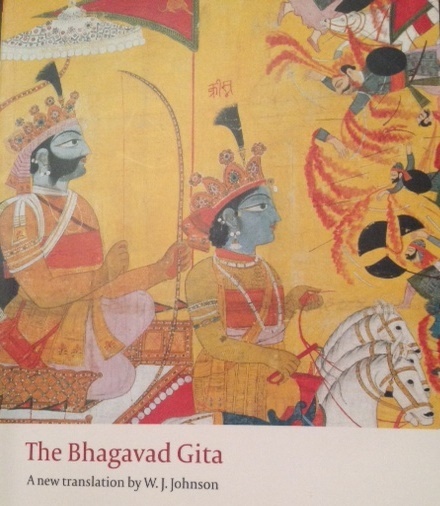 This after all is the message of selfless action in the Bhagavad Gita: “for when a man has renounced all intention to obtain a particular result, and clings neither to actions not to the objects of the senses, he is said to have attained yogic discipline” (BG 6:4).